The flowers are similar in shape to those of snapdragon, and the family to which Boschniakia belongs, Orobanchaceae, is closely related to the family to which snapdragons and penstemons belong (Scrophulariaceae). 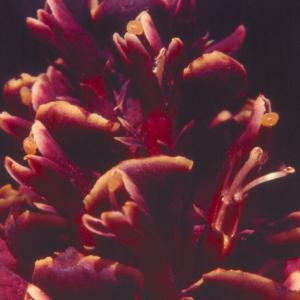 Also, some partially parasitic flowering plants that are green, such as Indian Paint Brush (Castilleja) now are placed in Orobanchaceae. There are four species of Boschniakia. They occur in northwestern North America and in northeastern Asia.